Much has been written about leadership: rules, pointers, styles, and biographies of inspiring leaders throughout world history. But there are certain leadership ideas that we ourselves fail to recognize and realize in the course of reading books. 1. Leaders come in different flavours. There are different types of leaders and you will probably encounter more than one type in your lifetime. Formal leaders are those we elect into positions or offices such as the senators, congressmen, and presidents of the local clubs. Informal leaders or those we look up to by virtue of their wisdom and experience such as in the case of the elders of a tribe, or our grandparents; or by virtue of their expertise and contribution on a given field such as Albert Einstein in the field of Theoretical Physics and Leonardo da Vinci in the field of the Arts. Both formal and informal leaders practice a combination of leadership styles. • Goleman’s six emotional leadership styles - visionary, coaching, affiliative, democratic, pacesetting, and commanding. Although certain people seem to be born with innate leadership qualities, without the right environment and exposure, they may fail to develop their full potential. So like learning how to ride a bicycle, you can also learn how to become a leader and hone your leadership abilities. Knowledge on leadership theories and skills may be formally gained by enrolling in leadership seminars, workshops, and conferences. Daily interactions with people provide the opportunity to observe and practice leadership theories. Together, formal and informal learning will help you gain leadership attitudes, gain leadership insights, and thus furthering the cycle of learning. You do not become a leader in one day and just stop. Life-long learning is important in becoming a good leader for each day brings new experiences that put your knowledge, skills, and attitude to a test. The best way to develop leadership qualities is to apply it to your own life. As an adage goes “action speaks louder than words.” Leaders are always in the limelight. Keep in mind that your credibility as a leader depends much on your actions: your interaction with your family, friends, and co-workers; your way of managing your personal and organizational responsibilities; and even the way you talk with the newspaper vendor across the street. Related: YOU ARE THE ACTOR OR ACTRESS OF YOUR OWN STORY. Repeated actions become habits. Habits in turn form a person’s character. Steven Covey’s book entitled 7 Habits of Highly Effective People provides good insights on how you can achieve personal leadership. Leadership is not the sole responsibility of one person, but rather a shared responsibility among members of an emerging team. A leader belongs to a group. Each member has responsibilities to fulfill. Formal leadership positions are merely added responsibilities aside from their responsibilities as members of the team. Effective leadership requires members to do their share of work. Starting as a mere group of individuals, members and leaders work towards the formation of an effective team. In this light, social interaction plays a major role in leadership. To learn how to work together requires a great deal of trust between and among leaders and members of an emerging team. Trust is built upon actions and not merely on words. When mutual respect exists, trust is fostered and confidence is built. How come dictatorship works for Singapore but not in the United States of America? Aside from culture, beliefs, value system, and form of government, the current situation of a nation also affects the leadership styles used by its formal leaders. There is no rule that only one style can be used. Most of the time, leaders employ a combination of leadership styles depending on the situation. In emergency situations such as periods of war and calamity, decision-making is a matter of life and death. Related: 3 POSITIVE STEPS TO DISCOVER THE PURPOSE OF LIFE. Thus, a nation’s leader cannot afford to consult with all departments to arrive at crucial decisions. The case is, of course, different in times of peace and order---different sectors and other branches of government can freely interact and participate in governance. Another case in point is in leading organizations. When the staffs are highly motivated and competent, a combination of high delegative and moderate participative styles of leadership is most appropriate. But if the staffs have the low competence and low commitment, a combination of high coaching, high supporting, and high directing behaviour from organizational leaders is required. Now that you are reminded of these things, keep in mind that there are always ideas that we think we already know; concepts we take for granted but are actually the most useful insights on leadership. 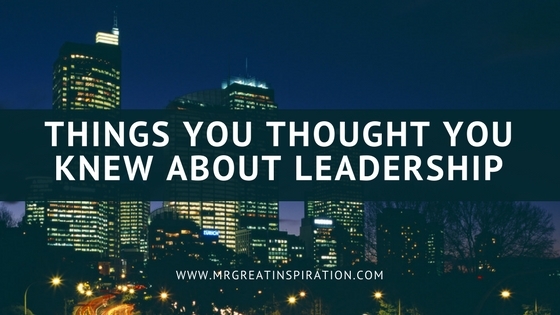 We hope guys you find our article "Leadership Exposed: Things You Thought You Knew About Leadership" by Mr Great Inspiration useful.